If the oven in your kitchen needs deep sanitising after a dinner gathering, guests or to keep it clean, you can use our professional services. The cleaners in our company carry out effective sanitising of the internal and external areas in cooking appliances, their doors and removable components. Take advantage of the high-quality oven cleaning services which we offer in Battersea and you will be pleased with the end results. The work of our cleaning technicians is effective, safe and ensures full removal of greasy marks, burnt food and odours from electric, gas, range and other kinds of ovens. Our cleaning technicians use special dip tanks mounted in their vans to soak and dissolve grease, carbon deposits and dirt from electric, gas, range and other ovens. They soak the removable parts of the appliance and ensure its better degreasing. The work of our staff starts with inspection. Then, our cleaners carry out soaking the detachable parts, wiping and scrubbing the internal surfaces of the appliance, its body, hobs, glass panels, oven door and knobs. 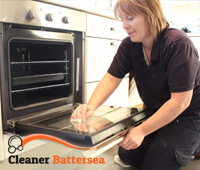 Our oven cleaning services are available in SW11 and in the surrounding areas. You can book our cleaning services after parties, special events, guest gatherings and for maintenance of your kitchen appliances. Greasy marks, stains and food leftovers will not only slow down the performance of your oven, but spoil the taste of the cooked meals by mixing the smells. The appliance needs more electricity power to heat if it hasn’t been cleaned which will increase you bill. 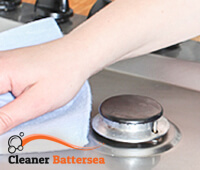 Use our oven cleaning services provided within Battersea, SW11 at competitive rates.